Kia (shown) and PSA have closed their plants in Slovakia because they cant get enough natural gas. PRAGUE -- Automakers in central and eastern Europe are being hit by Russias decision to shut off natural gas deliveries to the region. Kia Motors and PSA/Peugeot-Citroen have closed their plants in Slovakia and Suzuki has shut its factory in Hungary because they cant get enough gas to operate. PSA also has postponed the sales launch of the Citroen C3 Picasso to March from February, company sources said. 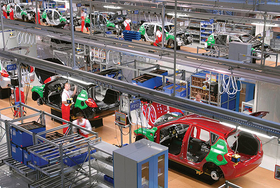 The small minivan is being built in PSAs plant in Trnava, Slovakia. A PSA spokesman said the production disruption will slow down the launch. You cant launch a new car without having vehicles in stock, the spokesman said. PSA halted production in Trnava January 8 after gas supplies stopped. The plant normally makes 850 cars a day on two shifts. PSA and Kia, along with other industrial companies, have had their gas consumption restricted on a day-to-day basis, sometimes only receiving enough to keep production equipment from being damaged by the winter cold. The PSA and Kia plants use natural gas to heat production halls and to fuel ovens in their paint shops. The ovens are needed to bake the paint on to new cars. We are almost fully dependent on gas, said PSA plant spokesman Peter Svec. Even if Russia and Ukraine resolve their differences immediately, restrictions on gas supplies will likely remain in place throughout January, according to information from the Slovak gas company SPP. Volkswagens factory in Bratislava, Slovakia, has not been hit by the gas shortage. We are looking at developments closely, spokeswoman Daniela Rutsch said. Audis factory in Györ, Hungary, also is unaffected by the gas shortage. We dont use much gas in the production process, said Audi spokesman Peter Lore.